We are planning on fixin up the Children’s Church (the Rock) room with some installed stuff and décor. Not crazy because its still not our room but we want to raise the bar for both our kids and theirs. to bug me about it. Sorry, I was doing so well, then...crash and burn, I stopped blogging. Just been busy and distracted. I will try harder to keep you all in the know. Been doing a lot of thinking about the permanent install stuff at the Boys & Girls Club. We got a lot to do and I am itching to get on it. I am planning on going up there today to mess around and get some measurements, run the sound snake and vga cable, stuff like that. The problem is Sheila wants to do something fun and I don’t thing she sees that as fun. Anyway, will get you updates on service tonight. first off check Jasons blog. Wasn't that awesome?! We had a blast. THIS WAS CHURCH at its best. So when we got back for lunch. Mark form Cubbies came out to cook some of his burgers and hot dogs for us. When I told him that we'd come by Monday with a check, he told me "NO WAY" this is on him! So while we were out blessing the town, he was under a hot grill blessing us! He cooked 100 hamburgers, 100 hot dogs and provided all the fixens! So this guy who doesn't even go to our church blessed 100+ of us with free lunch...We Got Served! So if you are coming to Greenville/Winterville, you need to stop in to Cubbies on Worthington near Old Tar and see Mark and his crew! 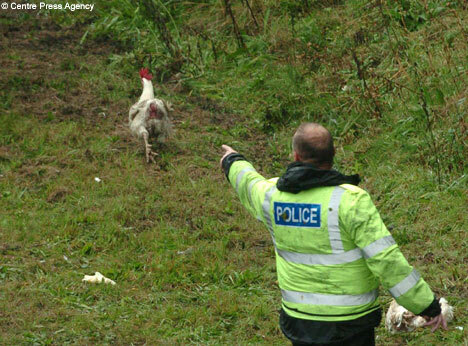 This is taken from the "Daily Mail.co.uk"
Why did 3000 chickens cross the road? Because the lorry they were in crashed on one of Scotland's busiest motorways, that's why. 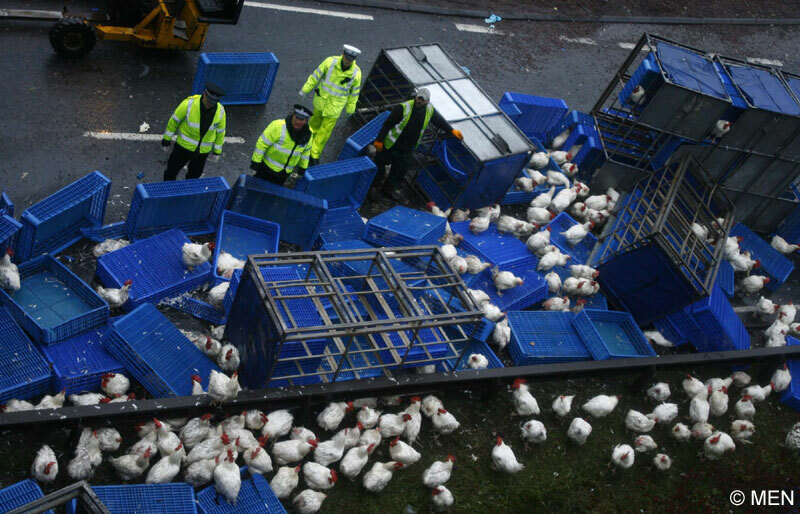 Thousands of runaway chickens brought traffic to a standstill after a transporter lorry crashed on a busy road near Glasgow. 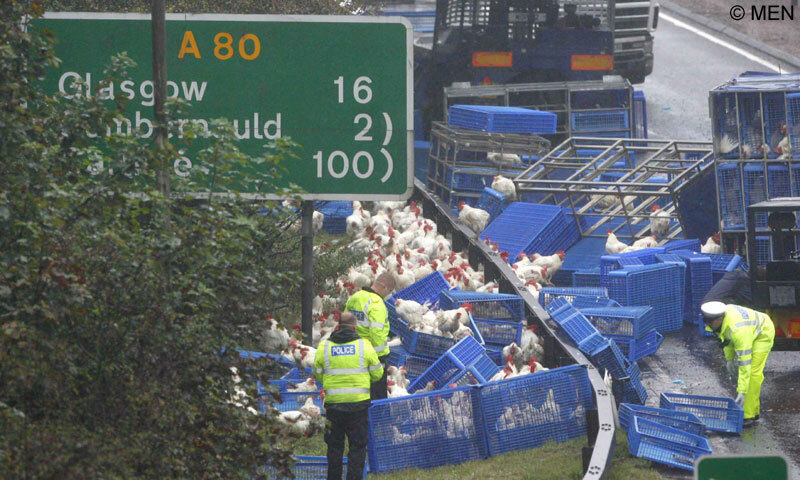 The A80 heading towards Glasgow was shut for more than eight hours as the birds were rounded up by a specialist team drafted in by police. 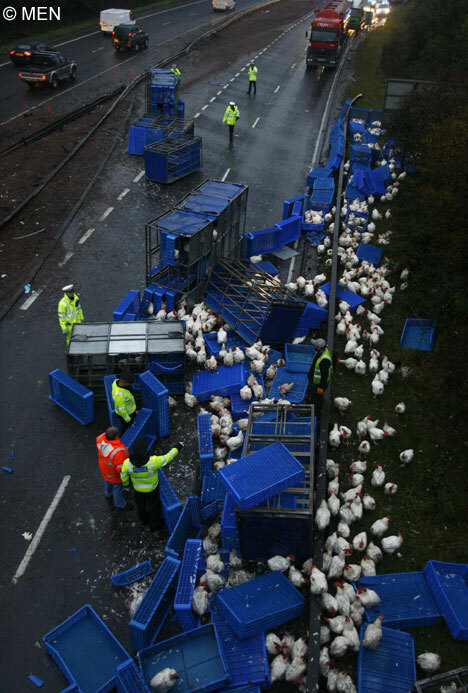 The lorry carrying 3,000 live chickens jack-knifed near Castlecary at around 4.30am causing feathery mayhem for motorists travelling south and north. The southbound carriageway was shut throughout the rush-hour, causing major tailbacks, with the M80 and M876 approach roads also closed. Central Scotland Police said the 45-year-old driver of the lorry was treated at hospital for serious, but non-life threatening, back injuries. The A80 is the main route into Glasgow from Stirling, Perth and the north of Scotland and is a notorious blackspot for traffic delays. Her: "Why are you so later!" Ok a whoppin 14 1st time guest! 5 second timers and 2 third timers! when you put the greatest young minds at Discovery Church in a van together? You can make excuse or you can make an impact! After our 4 hour traffic jam we were hungry...Big Surprise! 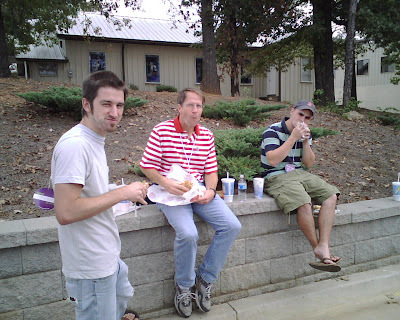 And being that some of us had some arteries that were not clogged yet, we stopped at the next Burger King. One of the first things I noticed is that one of the ladies working wasn’t in uniform. I soon found out why. They had a few workers call out sick. We waited forever for our order to be taken and even longer for our food. 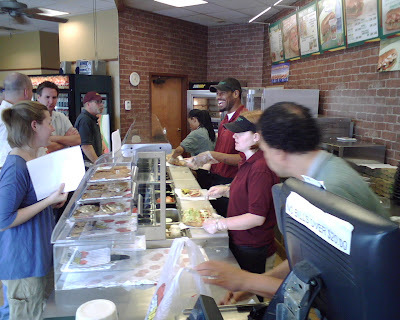 The one guy taking orders was in NO hurray at all. I asked him what the hold up was and he started complaining about the workers who called out. While he gripped about it, he completely stopped working! I looked through into the kitchen and noticed that the few people back there were working at a slow pace as if nobody was waiting on them to get their food from the grill into their bellies! The ONLY one rushing was the girl not in uniform. I got my food and headed for the condiment bar…OUT OF STOCK! No napkins, no ketchup and a mess. Well after cleaning it up and restocking a few things myself I sat down, prayed and ate my food while my hungry van partners waited in line. I finished my food before they all got done ordering their food! That was an example of a guy making excuses. 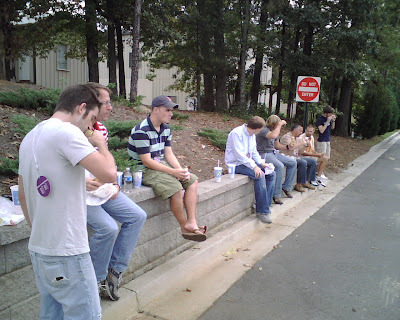 The 1st day of Catalyst we went the next block over for lunch to avoid some of the 11,000 hungry preachers. We decided on a Subway. Now you all know that Subway isn’t the quickest fast food out there but this place absolutely rocked! There were already 5 or so people in line and we came in the door with 7 more and there were more behind us. I thought for sure that we made a mistake. But let me tell you, these workers were slamming. They were taking orders on down the line and setting up the nest worker. They assembly lined our subs! I really think they had a separate mustard and mayo guy! Anyway, I told the manager that I was impressed by the way they moved us through so quickly. He said “were are just doing the best we can to handle all the extra people.” They could have easily kept a slower pace and not care about their customers at all but they choose to get into the zone and serve us at their best, and that they did! We can learn a lot from them. So if you are in N.C. near Hooly Grove and need some fast food, don’t go to the Burger King! But when in Atlanta, feel free to stop by I85 and Old Peachtree Rd. and get a sub from people who think YOU matter! Look at thier faces, do they look like they have a full house! There isnt a seat left so we have to go outside to eat. The people we choose to be around! Ok, here is who we crammed into Jason’s 6 passenger van for the Catalyst Conference: Jason (duh! ), Me (double duh) Davey (our music dude), Randy (our other music dude who is a youth dude also), Marcus (he is Daveys caddie) and Brad (our movie dude). We covered about every area of discovery church from The head pastor to music, tech, multimedia and children by choosing these 6 people to go. When it comes to picking these guys brains...read the sign! 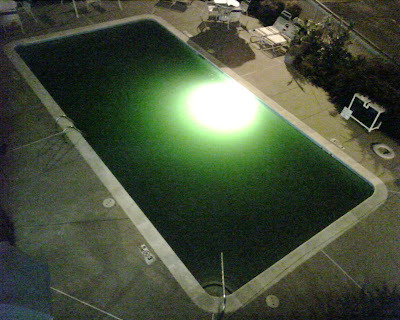 Even Randy would not go swimming in this pool...beleive me we tried. Yes it IS green! and glowing! This is the look Brad had all day long on both days. He was like a sponge! I think we all had a great time and got some learning on the side. On ride, there at about an hour and a half into the trip, we saw a sign saying the road was closed due to a traffic jam and to take a detour…real men DON’T detour! So 3 hours later we have traveled 6 miles! We asked a trucker (cb’s work great in traffic jams) what was going on and he told us a semi-truck crossed the median and ran over a car, killing 3 people! This was terrible to say the least. I got to thinking that 3 people were not coming home for dinner tonight! Their families have instantly lost them. How fast can a life turn around? One minute your loved ones are on their way home and the next your family is ripped apart! Have you ever read 1 Thessalonians 5:17? It simply states: pray continually;! I have, and I wondered: what was I to pray? Well I bet the family of three travelers could give us a million things to pray for continually. We don’t know what tomorrow will bring so safety and wisdom is a good start. anyway, may God be with thier familys and may they be with God! Amen. Over the next few post I will be highlighting my take on this trip. 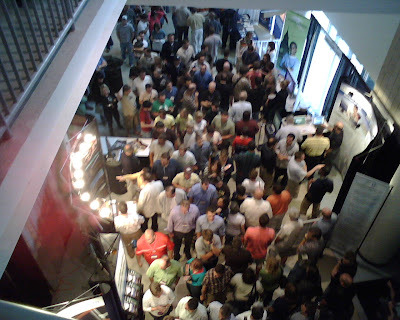 You may be asking yourself: “self, what is Catalyst?”, Well here is a description from: http://www.catalystspace.com/ “An unrivaled gathering of young, talented, and highly creative leaders. An event that addresses the unique needs of Next Generation Leaders, their vision, and their unique revolutionary spirit. 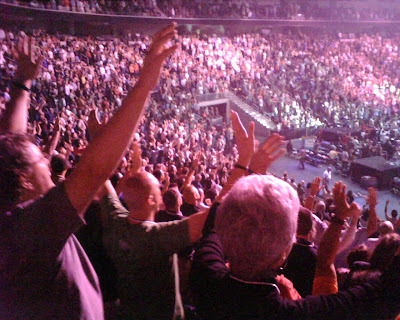 Three days of inspiring content, powerful worship, and unprecedented experiences. It's Catalyst. Go to that site for more info. We went Last year for the first time and it was awesome! So we had to go back for more! 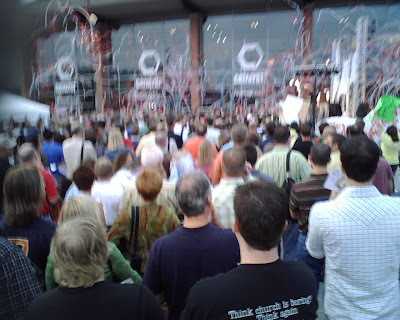 I was amazed at some of the speakers hitting hard on some serious issues that we all deal with. I will do a little break down of some of the ones that touch/challenged me in later post. Here are a few phone pics that I took. I will be getting some better pictures up on our site as soon as I can. guess what I am doing? I am sitting in a van stuck in a traffic jam watching Jason blog about it...BORING!!! Actualy, he cannot figure out how to sign it so this blog will be up before his. Have you ever passed by a penny on the ground and NOT picked it up? Have you ever thought why you didn’t bother to pick it up? Maybe because it isn’t worth that much to you, you didn’t have the time to stop, your back hurts and you don’t want to strain it or maybe its just dirty and you don’t want any dirt on you! Well this week in service we touched on it. No, not the penny…the lost opportunity! You see, the lost penny is a lot like lost people. They need to be valued and loved, but too often we don’t recognize their worth, we are in a hurray or we don’t want to put out the effort into them. Did you know that the penny on the ground is worth just as much as it was the day it was created? Well so are the lost people. They are worth the effort and we need to be loving them, not just passing by thinking: someone else will get it. Don’t miss the opportunity to bless people. Go the extra mile and see the value. So tell me, who’s had the best week ever last week? Don’t know? Read on and enjoy. Ok, to start with be sure to check my Saturday afternoon post about the cop (below). Ok, We are doing a series on Outflow. It is dealing with God love first filling us up and then overflowing into our family, friends, town and even our world. 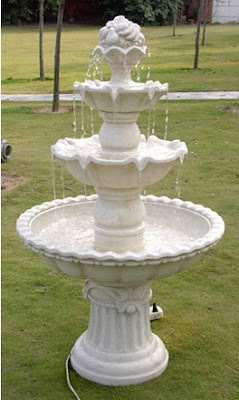 The message reminds us of a fountain…so we got one! Jason set up a large (outdoor) fountain in the middle of the church floor, filled it with water and let it run all during service. This was our third week with the fountain and we got a little (but growing) surprise. Someone put soap in Jason’s fountain!! !